Notes: Original title: Original title: Barbari: l’insorgenza disordinata, Edizioni NN. 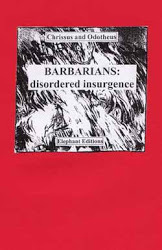 This Elephant Edition first published 2004. Why take the trouble to criticize the theses of Empire, when reality has so generously seen to it? Certainly not because it is a successful book, talked about in universities and on television. Discussions of opinion don’t interest us. We criticize the ideas of Negri (and Hardt) because they are a practical force, since they represent the most lucid version of the program of the left-wing of capital today and influence a movement — the “disobbedienti” — capable of supporting such a program. “Disobedient” politics, in fact, represents an excellent terrain of experimentation for the democracy of the future. Let’s see in outline why. In the face of the crisis of old-style militant politics, the “disobedient” galaxy (in particular former White Overalls and the Rifondazione Communista party), with its slogans so well-adapted to the middle classes, constitutes a force of mobilization. The parties and unions are often pulled along by its initiatives. For example, it is thanks to its demonstrations that the CGIL [Italian trade union organization] recovered an “oppositional virginity”. Forced to bolt by workers during the last major self-organized general strike, the union directors came back to make a pretense of battling the bosses. The same goes for the Stalinists of the former PCI (Italian Communist Party), whose constant work as informers is remembered by the rebellious workers of the 1970’s. No party or union would have gathered the numbers for the Social Forum in Florence, for example. The “disobedient” practice of spectacular actions and of relations with the media allows what the old party secretaries were never allowed: to become a leader within a few weeks. Thanks to the “disobedient” leaders, the State has issued its ultimatum: you either dialogue with the institutions (in fact, this is what passes for “non-violence”) or you are a terrorist to be repressed. The various international agreements signed following September 11 are meant in this sense. In the management of the streets, as well, the pacifist ideology is a tremendous field of investment for power. If the international proposals of the “Disobbedienti” (for example, those in Political Europe: Reasons for a Necessity, published last year [in Italy] by Manifestolibri and edited by Negri along with others) are added to this, one will realize how all of this is functional to the economic and political conflict between Europe and the United States. For the professor, Europe would be a “counterpower with respect to the capitalistic hegemony of the Empire”, a “war machine for the extension of new basic rights to the citizens of the Empire”. Defending militarily and monetarily united Europe as the place for a new democratic politics from below... this is too much even for the Negrian dialectic! If this is the “other” world, we don’t have any doubt that it is possible. Finally, the basic system is that of the most vulgar and triumphalistic Marxism: the development of the productive forces is for Him the factor of progress that unenlightened capitalists, i.e., the bad globalization, are obstructing. But the movement has the cooperative and social character of the current economy on its side. If you haven’t noticed, communism is winning. While capitalist barbarism advances, another barbarism, with a frequently incomprehensible language, is making its way — the one that spits in the plate of democracy and wants to give the boot to the State, money, prisons and all hierarchies. We think it is important to have a confrontation about these topics, even at the risk of disturbing the sleep of the civilised. Antonio Negri was born on August 1, 1933 in Padua, Italy, the cultural capital of the traditionally bigoted, petty bourgeois Veneto region. A fervent believer, the young Toni Negri discovered militance when he became a part of the religious youth organization “Catholic Action”. The 50’s in Italy were the years of the re-launching of the country’s economy, a prodigious capitalistic phenomenon that remained forever in the eyes and the heart of Negri, who, after having replaced God with Marx, began to frequent the environments of the New Left. In the 60’s, Toni Negri actively participated in the elaboration of workerism, as editor of “Quaderni rossi” (“Red study books”) first and later of “Classe operaia” (“Working Class”). What is workerism? It is the ideology according to which the factory is the center of class struggle and the workers are the only builders of revolution, because, with their struggle, they push capital to develop in the liberatory direction. The workerists take aim at parties and unions, but these latter are not so much criticized as rebuked for not carrying out what is supposed to be their duty effectively. As for all the forms of struggle that are outside of the factory environment, they are either condemned or snubbed. No need to say that none of the various intellectuals who gave life to workerism, usually escapees from the Socialist and Communist Party, have ever worked a single day in a factory. Negri, for example, preferred by a long shot to teach “Doctrine of the State” at the university of Padua and leave the dubious pleasure of the assembly line to the proletarians. The workerist strategy, beyond a phraseology that is at times extremist, consisted in the desire to “ place back in motion a positive mechanism of capitalistic development” within which “to put into play the demands of a heavier workers’ power” through “the revolutionary use of reformism”. In 1969, Negri was one of the founders of “Workers’ Power”, an organization that combined the usual apology for the existent (“the entire history of capital, the entire history of capitalist society, is in reality workers’ history”) with a declared hegemonic aim over the rest of the movement, that was crystallized in the condemnation of “spontaneism” in the name of a more efficient centralization of the struggles (“to assure in acts the hegemony of the workers’ struggles over the student and proletarian struggles... in order to plan, lead, direct the mass workers’ struggles”). “Workers’ Power” dissolved in 1973 without having managed to direct anything and from its ashes the political area known as “Workers’ Autonomy” (“Autonomia Operaia”) was born, which was also hounded by Leninist phantasms of the conquest of power. We are at the beginning of the 1970’s, when the revolutionary movement as a whole begins to pose the problem of violence. In his books, Toni Negri exalts the figure of the “criminal worker”, justifies the recourse to sabotage and armed struggle, but always within a Marxist-leninist vision of the social conflict. In Negri, an unconditioned acceptance and justification of capitalism is always present, since, as he wrote in his book that appeared in 1977, “communism is imposed first of all by capital as conditions of production... Only the construction of capitalism can give us truly revolutionary conditions”, an identification that in his opinion must be taken to extreme consequences: “the most advanced capitalistic form, the form of the factory, is taken up into the workers’ organization itself.” But, although his theoretical production is rather profitable, it cannot be said that this corresponds to an equal practical influence. The thousands of revolutionaries who participated in the armed assault against the state, an assault that reached its peak around 1977—78, did not know what to make of the philosophical analyses of the Paduan professor. However, it was taken seriously by a magistrate of his city, Guido Calogero, according to whom Negri would have then been the true leader of the Red Brigades. A blatantly absurd hypothesis, but one that was nonetheless well suited to the needs of the state: to bring a portion of the movement, the most obvious part, into the spotlight, with the aim of causing the movement in its totality to pass into silence. In the sphere of the actions that had already happened with the Red Brigades, whose feats raised such a media clamor as to conceal the thousands of little actions of attack carried out in those years. Why not repeat the same operation in the field of ideas, using the high-sounding name of the Paduan professor? And above all, why not link the two aspects? Thus, the judiciary odyssey of Toni Negri begins on April 7, 1979, when he is arrested along with dozens of other militants in the course of a police raid against the environments of Workers’ Autonomy. The charge is subversive association and armed band, but in the course of a few months, the charges against Negri multiply to the point of including armed insurrection against the powers of the state, kidnapping and murder of the Christian Democratic leader, Aldo Moro, and 17 other murders (charges of which he would be exonerated in the course of the following years). This is the period in which the “confessions” of penitents and the special laws desired by Minister of the Interior Cossiga fill the prisons with thousands of militants, sparking strong social tensions. In December of 1980 a revolt explodes in the prison of Trani, where Negri is being held. Victim of the media image of the “wicked teacher”, Negri is incriminated with the charge of having been one of its instigators (five years later, at the end of the trial, he would be exonerated). In reality, besides continuing to write books, Negri is much more interested in the consolidation of the state than in its subversion. In his writings he starts to formulate the aberrant hypothesis of dissociation. Deprived of any dignity, accustomed to the worst opportunism, Negri suggests to the state that it concede judiciary benefits to those political prisoners that publicly repudiate the use of violence and declare that the war against the state is objectively ended. Needless to say that with regard to those prisoners that will not disown their choices, the state would be justified in using the iron fist. Negri’s ideas start to spread in the prisons, the distant illusion of a freedom obtained through renunciation finds its beggars. In 1982, a document signed by 51 political prisoners is spread in which the epoch of armed revolt against the state is declared finished, the first in a long series. In February 1983, the trial against Negri and the other defendants arrested during the raid of April 7, 1979 begins. Profiting from the clamor of the trial, the Radical Party — who represent the “sincerely democratic” bourgeois eulogists of nonviolence and pacifism — propose to Negri that he run for office in their lists for the upcoming elections. In case of election, there would be liberty for him due to parliamentary immunity. The radicals however require Negri to remain in Italy and go on fighting the battle for his liberation from prison if parliament takes away his immunity,. Negri accepts the candidacy and promises the Radicals that in no case would he escape abroad. Elected to the chamber of deputies on June 26, Negri gets out of prison July 8, 1983. His release provokes the reaction of conservative political forces that work throughout the summer to arrange the vote on the abolition of Toni Negri’s parliamentary immunity on September 20. On the eve of the vote, September 19, Negri takes refuge in France. The next day the parliament takes away his immunity by a vote of 300 to 293. On September 26, the “April 7” trial ends with the sentencing of Negri. It cannot be said that Negri knew the hard life of the exile for long in France. A university professor of international fame, already by November 1983 he was named a foreign member of the council of the International College of Philosophy. From 1984 to 1997, Toni Negri taught at the University of Paris-VIII and the normal high school at rue d’Ulm. In the meanwhile, in Italy, the state accepted his suggestion and passed a law that rewards dissociation. Moreover, he carried out research on behalf of some Ministries and other French government institutions. During this period Negri published various books and discovered his affinities with the French post-structuralist intellectual, with whom he shares for example the denial of individual autonomy. Among his interventions of these years, we remember his adherence to the demand for an amnesty that decreed the end of the struggles of the ‘70’s, his sympathy for the new party of the League (racist party, defender of the interests of small and middle businesspeople, born not by chance in Veneto), his public reconciliation with former minister of the Interior Cossiga, the main one responsible for the repression of the movement of the 1970’s. On July 1, 1997, Toni Negri voluntarily returned to Italy and was locked up in the Roman prison in Rebibbia, where he must finish serving the sentences with which he was charged (notably reduced due to two general amnesties conceded in 1986 and 1988). In July 1998, Negri got outside work with a cooperative of voluntary work linked to the Charities; in August 1999 he obtained partial liberty (he goes out of the prison in the morning to return in the evening). In 2000, Negri returns to the spotlight with the publication of the book Empire, written in collaboration with Michael Hardt, that won enormous success. In Italy, where his name rouses ugly memories and is therefore the victim of an editorial industry subjugated to the most conservative political power, his book would only be published in 2002. Toni Negri is now the political point of reference of the Disobbedienti (former Tute Bianche — White Overalls), whose language, though sometimes extreme, has nonetheless not hindered them from fully taking part in the institutional left.